Movie star and racing driver Steve McQueen had an idea to make a film based on the Le Mans 24H racing. 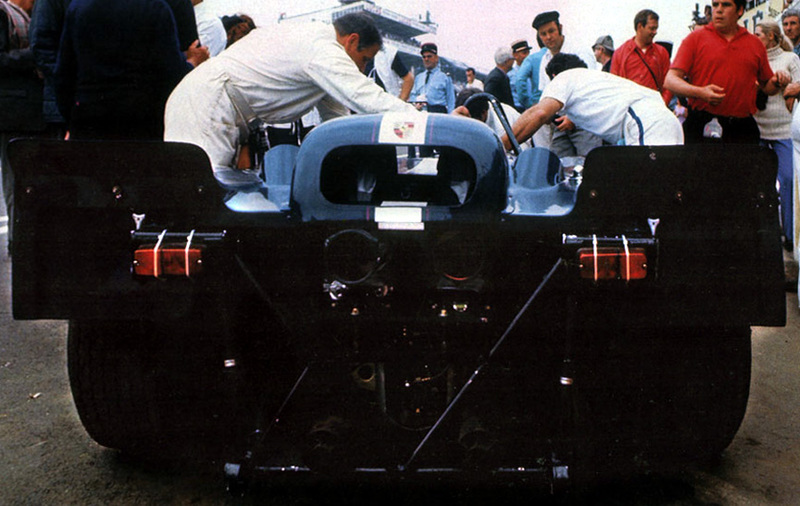 He had a personal Porsche 908 K Flunder Spyder (chassis 908-022) in which he had scored second in 1970 Sebring 12H. For the Le Mans the car was converted into a camera carrier and was equipped with three cameras, one in front and two at the back above the gearbox. The car was driven by Herbert Linge and Jonathan Williams. They had to make extra pit stops for changing the film rolls (or actually the full cameras as it was quicker), but still managed to cover 282 laps which was not bad for a 3-litre car with additional weight and ruined aerodynamics. The winning 4.5-litre 917 did 343 laps. 1970 was the first year that Porsche managed to take overall victory at Le Mans (and full podium in addition), so the numerous cameras were at the very right race. Although half the scenes are filmed during the actual race, it is a fiction movie. This means, the driver names and racing results in the film do not reflect the results of the race and the actual winning 917 is basically left out from the film. Unfortunately it rained a lot, so the footage shot during the rainfall aswell as during the night couldn't be used. After the race many drivers were used to film the fiction racing scenes in Porsche 917 and Ferrari 512. The combined length of the film rolls was an astonishing 10.000 metres. The finished 104-minute film is for true petrolheads - during the first half an hour no words are spoken. Drivers who helped making the film were Aldo Pessina, Andre de Cortanze, Arthur Blank, Brian Redman, Christian Baron, Claude Ballot-Lena, David Piper, Derek Bell, Dieter Spoerry, Edgar Berney, Erich Glavitza, Gerard Larrousse, Guy Chasseuil, Ham Akersloot, Helmut Kelleners, Herbert Linge, Herbert Müller, Hugues de Fierlant, Jacky Ickx, Jean Pierre Bodin, Jean Pierre Hanrioud, Jean Pierre Jabouille, Jean Sage, Jo Siffert, John Miles, Jonathan Williams, Jürgen Barth, Masten Gregory, Michael Parkes, Mimmo Neccia, Nanni Galli, Paul Blancpain, Peter Huber, Pierre Greub, René Herzog, Richard Attwood, Rob Slotemaker, Robin Ormes, Rolf Stommelen, Silvio Moser, Steve McQueen, Teddy Pilette, Toine Hezemans, Vic Elford. It took a year to make the film and it premiered in cinemas in June 1971.